Our dog was running excitedly back and forth on the patio this morning, so I stepped outside to see what he was looking at. As I did, a deer came around from the side of the house (less than 10 ft from where I was standing). 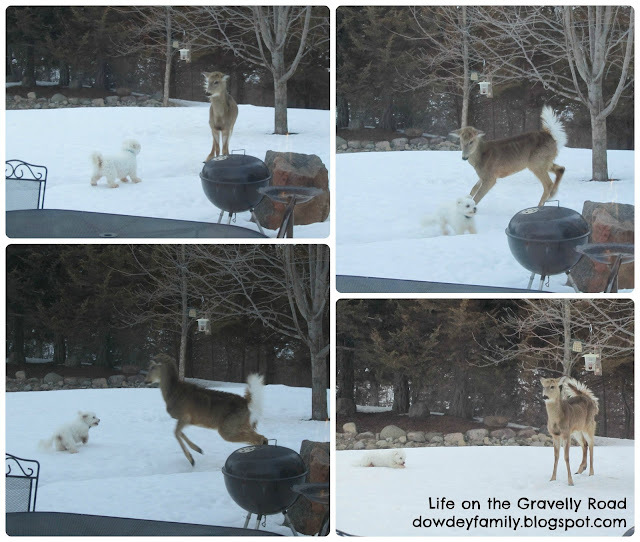 I snuck back inside and snapped these pics from the kitchen window. With all the snow and ice still on the ground, the deer have become less timid, coming closer to the house to empty the bird feeders, etc. This one was so hungry he was willing to tolerate our dog in order to try to get to the corn on the squirrel feeder. Some unique entertainment in our backyard on the gravelly road this morning!